Welcome to Doorstep Interview, where we find out more about the amazing bands and artists that we have right here in the north east. This time, the various members of folk-country group Gilded Thieves tell us about their influences and staying friends through thick and thin. Hi! 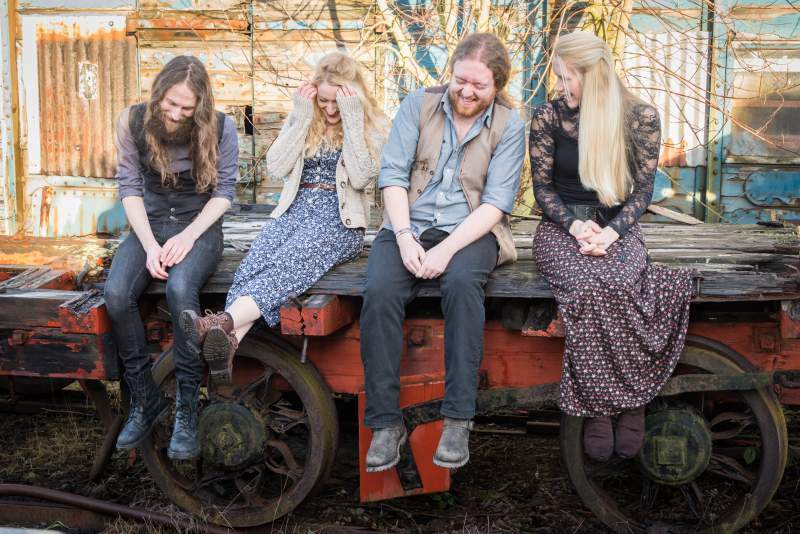 We are Gilded Thieves, a folk and country quartet based in Newcastle upon Tyne. We are John Dalziel (Mandolin & Guitar) Laura Jackets (Vocals) Sarah Cardnell (Violin) and David Fitzgerland (Guitar & Vocals). Laura: I love Bluegrass heroes The Steeldrivers – Chris Stapleton is my favourite country singer and their harmonies are sublime. I also admire Laura Marling for her veiled sort of storytelling. We all love artists like Richard Thompson, Dylan, Springsteen, and Frank Turner. Laura: I have always been inspired by folk tales, language, and lyrics. Most of our songs are born from words first; I have always been keen to tell stories. Most of our songs have really interesting characters at the heart of them. I’m inspired by a lot of country music and singers whose songs you can connect with lyrically. David: Our sound mixes foot-stomping bluesy romps with quirky folk ballads, fronted by intricate male and female vocals, delicately arranged around upbeat and engaging fiddle, mandolin and guitars. Sarah: We’ve all come from different paths and are a self-confessed “total mix” of styles. Our music is a bit like that: firmly rooted in Folk, but with tinges of Country, Americana, Blues, Soul, Swing, and other titbits thrown in. The local scene is diverse and brilliant and we’re happy to slot in just about anywhere as we know we’ll have a great night wherever we are. Tell us a bit about your live performances. What can we expect from a gig by Gilded Thieves? John: A lot of fun! We have a great time performing and that’s where our energy comes from. We’ve added bass and rhythm to our live performances, so we hope our audiences will be dancing even harder for us now! You’ll usually hear a daft anecdote or two from the band, too. John: We have a real mix of places we’ll be performing at this year-all over the UK– keep up with our band gigs by checking out our Facebook page. Laura: Frank Turner tweeted about us! He was picking the line-up for a festival, and mentioned our band. “Good Stuff,” apparently. That’ll do us! John may have cried a bit when we found that tweet – he’s a huge fan. We’ve also had the chance to support artists such as Jess Morgan, Larkin Poe, The Moulettes, Blackbeard’s Tea Party and Edwina Hayes, and we are proud of that as they are all excellent musicians and people. Laura: We’ve been so lucky in that we have maintained a brilliant friendship which has helped us overcome challenges; and we’ve stayed together through thick and thin. It’s difficult to manage a band; it’s a sacrifice lifestyle-wise, but it’s a choice, and we have so much fun doing what we are doing. We have all worked so hard to get to where we are right now; playing festivals and getting to experience all kinds of places and people. So it doesn’t really matter what we face; there’ll always be a song to write about it when we’re done, or a pint in the pub. Sarah: We’re pretty excited for some of the festivals we’re playing this year. Other than that, lots of gigs and lots of writing. We’re working on new material at the moment, which we’re very excited about. We can’t wait to show you all what we’ve been up to. Find out more about Gilded Thieves on their Facebook page.